In case of any confusion, I have provided a screenshot of the final step listed. If you have any questions, please feel free to ask. 1. 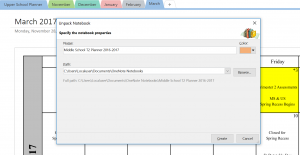 To add/remove students from an existing class or to create a new ClassNotebook, the link is www.onenote.com/classnotebook. Instructions can be found on the EdTech blog, http://willistonblogs.com/edtech/, by clicking here. 2. Students are encouraged to archive materials in a personal notebook if they would like to access their work from a ClassNotebook in the future. It would be good to remind them of this from time to time. Instructions for creating a personal notebook and moving/copying materials can be found, again, on the EdTech blog by clicking here. 3. When setting up gradebooks in Veracross, you have a choice between “Total Points” or “Weighted Categories”. It’s always a great idea to consult with your department chair to make sure your grading practices are aligned with those of the department and the school. 4. There has been more and more interest in screen-recording using Office Mix and Snagit. The Snagit key is: [Ask us via email], this must be entered the first time you use the program. 5. When using ClassPolicy, please remember to “End Class” when your class meeting has ended – students are restricted from programs until the teacher releases them. As a final plug … feel free to reach out to your AT consultant if you would like to work on integrating technology into your lessons. We are always excited to strategize and help implement new tools.